1R, 1K, 1DK, 1LDK Apartment: What’s the Difference and Which Should I Rent? When you are looking at apartment listings in Japan, rather than being told the number of bedrooms the property has, you’ll come across these terms: 1R, 1K, 1DK, and 1LDK. These abbreviations tell you how many rooms in total the apartment has, excluding the bathroom and/or toilet. In this article, we’ll explain what features to expect or not expect from each of these types of apartments. In the abbreviation 1R, R stands for “room”. Basically, this is a one room studio apartment. A typical 1R apartment has between 13-sqm and 20-sqm of floor space. Floor plan of a typical 1R apartment. 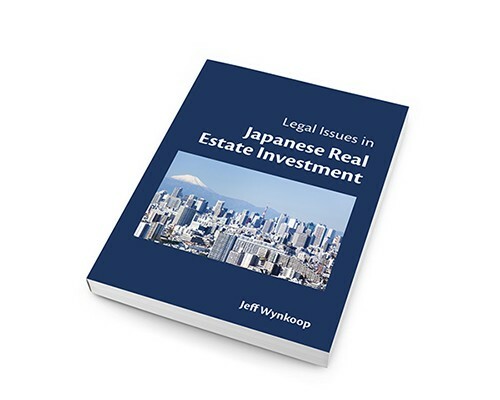 In almost all 1R studio apartments in Japan, when you walk into the property the first thing you’ll see to your left or right is the kitchen. In the example above, the kitchen is to the left and indicated by the rectangle (kitchen counter) with the curved rectangle inside (sink). Example of a typical 1R apartment kitchen. Some 1R kitchens do not come with a built-in cooking unit, so you will have to install one yourself. 玄: This is an abbreviation of 玄関 (genkan), the foyer where you take off your shoes. 洗: Means “wash”. This is the place where you will hook up your washing machine. In some studio apartments, the washing machine hook-up is located outside the apartment on the balcony. In some apartments in Japan, the washing machine hook-up will be located on the balcony, not inside the apartment itself. In a studio apartment, opposite to the kitchen is almost always the bathroom. Most people will want the toilet to be separated from the room where they bathe or shower. In this example, you have a separated bath and toilet. 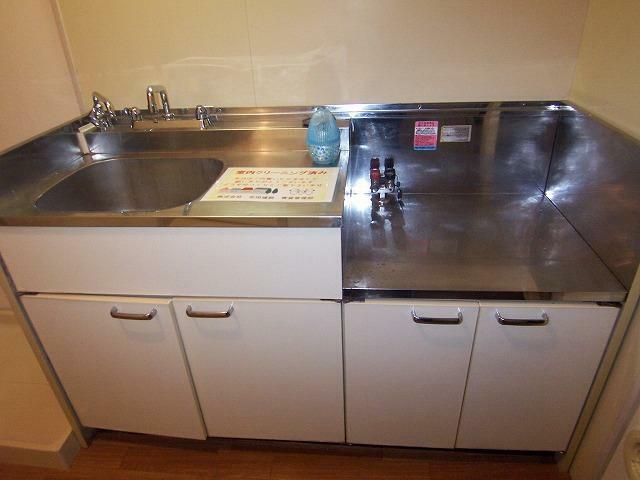 In almost all cases, you will get a “unit bath” in a 1R apartment. A unit bath is a bathroom where the tub, sink, and toilet are all in one room. This is an example of a unit bath where the bathtub/shower, sink, and toilet are all in one room and is very typical of what to expect in a 1R apartment. 浴室: Means the actual bath/shower room. WC: Means water closet. That would be the toilet! In most 1R studio apartments, the room will not have a closet, but in the example above, there is a closet, indicated by “CL”. 洋室: Means “western-style room”. This is the the actual “R” in a 1R apartment. They typically have very small kitchens with only one burner (or no cooking unit at all, so you’ll have to buy and install a counter-top range), small counter space, and enough space for a cube fridge. If you like to cook, a 1R kitchen could limit your culinary possibilities. Most 1R apartments do not have built-in closets. Some 1R apartments will not have space inside the apartment to hook up a washing machine. You’ll be sleeping and cooking in one room, so smells can waft from the kitchen area into your clothing or bedding. In the abbreviation 1K, K stands for “kitchen”. Basically, this is a one room studio apartment with a kitchen that is usually separated from the other room by a wall. However, there are cases where the kitchen in a 1K is not separated from the main room. This means that it is very similar to a 1R, even though the floor plan indicates that it’s a 1K. 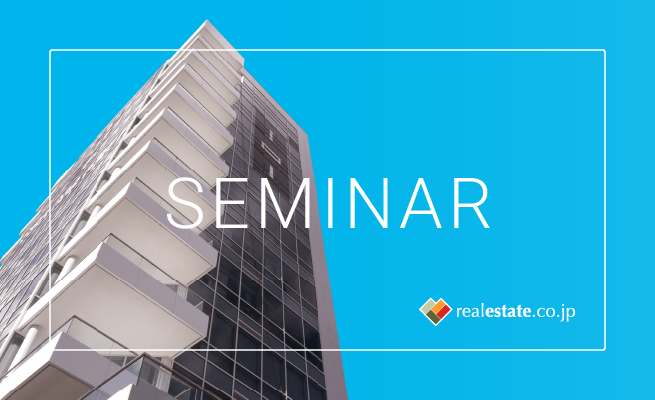 1K apartments typically have between 13-sqm and 25-sqm of floor space. Floor plan of a typical 1K apartment. The main difference between a 1K and 1R is that in most 1Ks, the kitchen is separated from the main room by a wall. In the example above, the kitchen is separated from the main room by a wall, so you don’t have to sleep and cook in the same room. However, 1K kitchen counters tend not to be much bigger than those in 1R apartments. This is a typical kitchen in a 1K apartment. In the example above, the property has a unit bath, which means the toilet is not separated from the bathroom and the washing machine hook-up is located on the balcony. 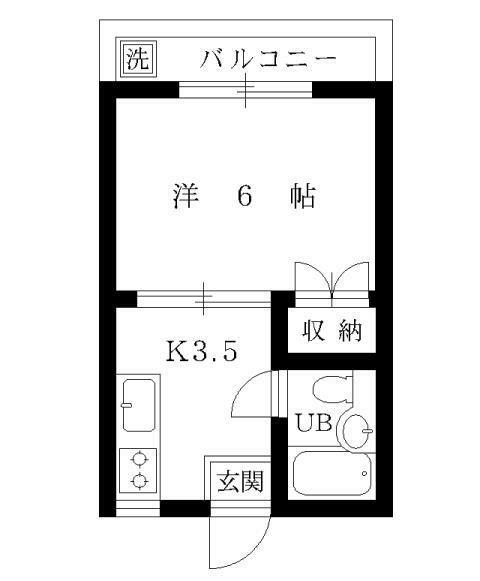 The numbers in the floor plan indicate the approximate size of the room in number of tatami mats. 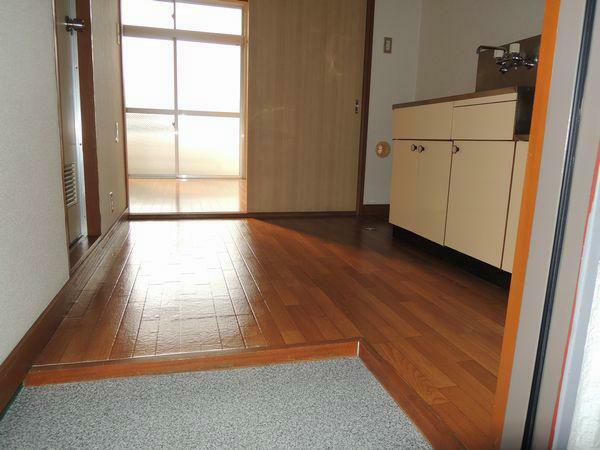 One tatami mat is equal to 1.65 sqm, so a 6-mat room is about 9.91 square meters. The kitchen is separated from the main room, but the kitchen counter itself is usually not very big. The main room in a 1K is usually similar in size to that of a 1R, which means that there is not much difference in roominess once you put in a few pieces of furniture. Many 1Ks do not come with built-in closets. Many 1Ks come with unit baths, rather than having a separated toilet and bathroom. In the abbreviation 1DK, D stands for “dining” and K stands for “kitchen”. 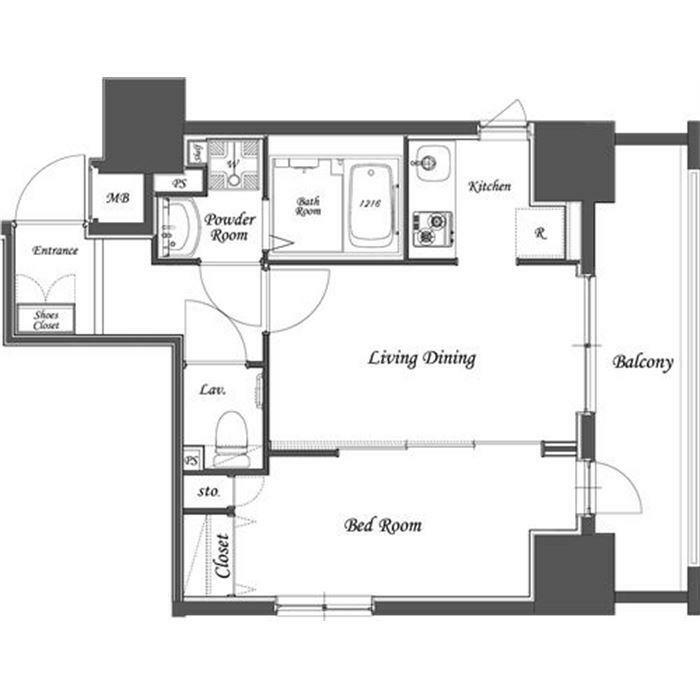 Basically, this is a two room apartment with a kitchen and dining space that is separated from the other room. 1DK apartments usually have between 25-sqm and 30-sqm of floor space. Floor plan of a typical 1DK apartment. 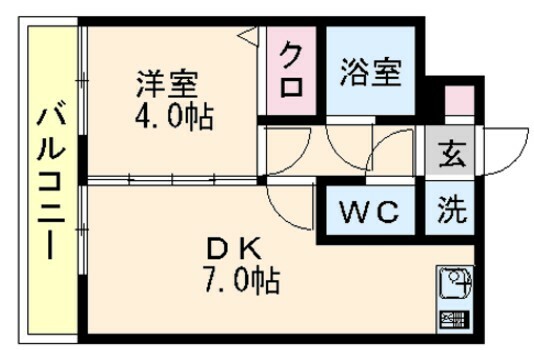 The separate room in a 1DK is usually between 4-tatami mats (6.61-sqm) and 8-tatami mats (13.2-sqm) and the DK (dining-kitchen) area is usually bigger than the separate room. The bathroom and toilet in 1DKs may be separated or you may have a unit bath. In the floor plan above, the bathroom is separate from the toilet. Most 1DKs have some built-in storage and a few even have a lot of built-in closets, so this certainly an advantage of renting a 1DK. If you see a floor plan that says it’s a 2DK, it means that the property has two separate rooms, in addition to the dining/kitchen area. In the abbreviation 1LDK, L stands for “living”, D stands for “dining” and K stands for “kitchen”. Basically, this is a one-bedroom apartment with a living/dining room and a kitchen separate from the living/dining area. 1DK apartments usually have between 23-sqm and 35-sqm of floor space. Floor plan of a typical 1LDK apartment. This apartment is approximately 35 square meters. A 1LDK is a proper 1-bedroom apartment. In a 1LDK the living/dining room will usually be bigger than the bedroom and there is usually at least one built-in closet, and in most 1LDKs, the bathroom will be separate from the toilet. If you see 2LDK in an apartment listing, it means the property has two rooms in addition to the living/dining/kitchen area. Of course, average rent for a 1LDK is higher than for smaller layouts, but if your budget allows, a 1LDK will give you a proper bedroom and enough space in the living/dining room to add more furniture and even a little style to your home.